How's this for a rare combination? A true Challenger T/A, in Panther Pink, with its original build sheet and original drivetrain�all of those pieces don't simply fall together! This 1970 Dodge T/A has a fresh, full rotisserie job to a rare car with an even rarer color combination documented by its original build sheet, this is a bright star amongst marquee muscle cars. Panther Pink isn't quite as bright as most think, and this car's sprayed right. The body is outstanding and the paint is flat and glossy. Both bumpers were treated to a high dollar re-chroming, as were the taillight bezels. The 70 Dodge T/A Challenger taillights, side markers and front parking lights are all close to perfect. The grille, correct in R/T textured black but with the standard Challenger badge, is excellent as is the hood molding. The original hood is still in place and is painted with the correct Organisol textured paint and holds the proper N94-only washer squirters. Reveal and drip moldings are highly polished, both splash pans are arrow straight and the stripes, door handles and badges are new and correct. Refinished 15" Rallye wheels with new trim rings and center caps host new F60 front and G60 Polyglas tires. The glass is excellent, and the windshield has the pre delivery exhaust sticker applied. The ducktail spoiler is the original, and the blackout decal underneath is applied correctly. From any angle or distance the car's a real attention grabber, and it's done right. 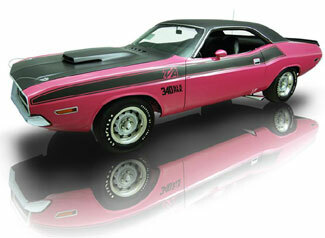 1970 Dodge Challenger T/A beautifully Inside, you'll sit on very comfortable restored seats with new seat foams. The dash pad is an excellent reproduction of the '70-only piece with the embossed Challenger nameplate and faux stitching. The '70-only console is also excellent and holds its original Slap Stik shifter with a new wood grain knob. The door panels are the excellent originals, as are the armrest pads. The headliner and carpeting are new, as are the Auto Custom Carpet floor mats with the T/A logo in Panther Pink thread. The '70-only AM radio is in place, the gauges are redone and crisply white, the vent cables are new and so are the door handles and lock levers. The steering wheel is a mint original with no cracks and perfect grain.